Do you think houseguests may be a hindrance to your private space? Well, Ajay Devgn and Konkona Sen Sharma's characters in Athiti Tum Kab Jaoge certainly think so, when their structured lives are rudely altered by a houseguest who refuses to leave. Directed by Ashwini Dheer, Atithi tells a simple and unconventional story, and sees great performances from the lead cast, which includes Paresh Rawal. 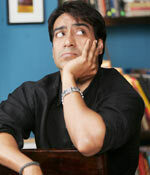 Devgn's Punit is film scriptwriter. His wife Munmun (Sharma) is an interior designer, and they live a happy life with son Ayush. Soon, Paresh Rawal's Lambodarchacha enters the film, and their home, and makes himself very comfortable. He turns out to be a pain, as all his mannerisms annoy his hosts no end. From waking up at 5:30 am and gargling loudly to making sure the maids don't last at their house, Lambodarchacha does it all. He also goes around slapping the watchman and 'teaching' him respect -- reminding us of Beena Kak's character in David Dhawan's Maine Pyaar Kyun Kiya. The actress played Salman Khan's mother. Punit and Munmun try their best to throw Lambordarchacha out of the house but none of their tactics work. Atithi Tum Kab Jaoge is a lighthearted entertainer that tickles your funny bone several times in the film. The film has its share of one-liners and and funny situations, which you can identify with. It bears a resemblance to Satyajit Ray's Bengali film Agantuk. There are unnecessary lectures on how guests are equal to God, and could have been edited out. Yet, Atithi Tum Kab Jaoge is an impressive film. Besides the lead actors, character actors like Sanjay Mishra, Mukesh Tiwari and Satish Kaushik also do well. The music is quite good, and as funny as the film. The Beedi Jalaile song from Omkara is remixed into a bhajan.